Family-owned and operated, Muskoka Overhead Doors & Openers specializes in residential and boathouse installations and repairs. 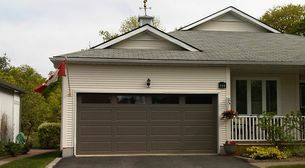 We supply and install overhead doors, garage doors, and garage door openers for Simcoe County and the District of Muskoka. Your overhead door is an important part of your home or boathouse. Rely on Muskoka Overhead Doors to make sure it’s installed right and working correctly. We provide world-class service on your door and opener at extremely competitive rates—and we get it right the first time. We are open year-round, so give us a call today to book your appointment! Contact us for your personalized estimate.